Nike® youth Therma-Fit hoodie with front muff pocket and WILLIAMS on the front. Purple. 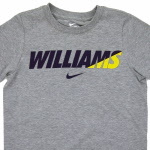 Nike® youth Dri-Fit T-shirt with WILLIAMS on the front in gold and white. Purple. 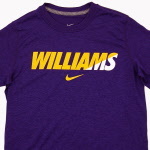 Nike® youth Dri-Fit T-shirt with WILLIAMS on the front in purple and gold. Dark heather.